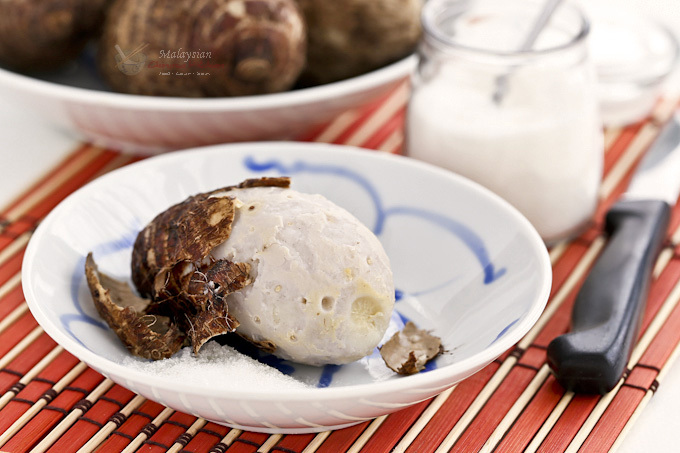 Boiled Baby Taro – an easy snack and a traditional food for the Mooncake Festival. Delicious eaten with a little salt or sugar. Boiled Baby Taro is a simple snack often associated with the Mooncake or Mid-Autumn Festival. This tradition is mainly observed by the Hakka and Cantonese people and is popular in Kuala Lumpur. Boiled Baby Taro is usually served at room temperature (unpeeled) along side mooncakes. To eat, simply peel and dip in salt, sugar, or a combination of the two. While baby taro is available almost year round here in Minnesota, it only appears in the markets in Malaysia round about this time. The flesh is more tender and has a slightly slimey texture. It is also whiter in color than regular size taro. As far as I can recall, Mom served baby taro only once a year during the Mooncake Festival. They were simply boiled and eaten as a snack. It was not cooked or used in any other dishes. She prefers the starchier regular size taro for cooking. I am uncertain as to why baby taro is eaten during this festival. Some have suggested that it may have been the first food discovered at night in the moonlight. 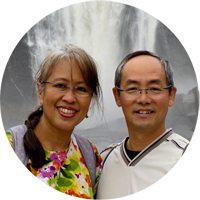 There may be some truth in this because taro is harvested in the fall and there is an abundance of it at this time of the year. 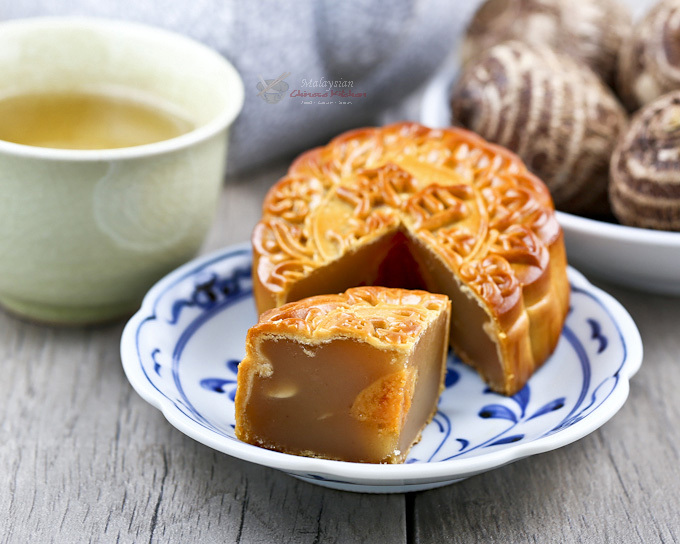 An easy snack and a traditional food for the Mooncake Festival. Delicious eaten with a little salt or sugar. Wash and scrub baby taro. Place in a medium size saucepan and cover with water. Place on the stove, cover, and bring to a boil. Add salt. 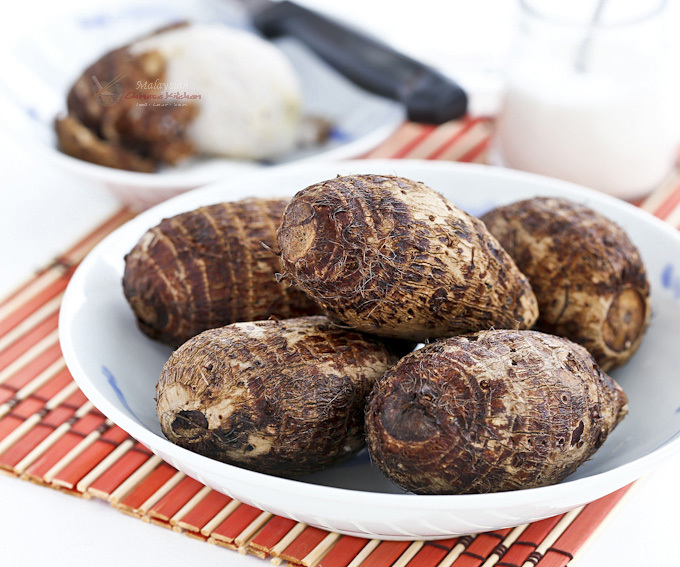 Reduce heat to medium and cook for 20 to 25 minutes depending on the size of the taro. Pierce with a fork to test for doneness. Drain and remove from saucepan. 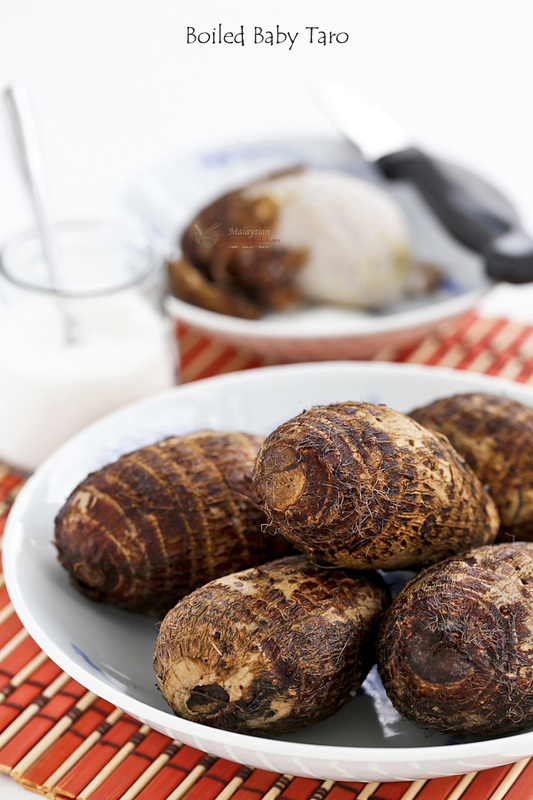 To serve, peel baby taro and dip in salt or sugar or a combination of the two.